Tough Travels from the fantasyreviewbarn provides a fun fantasy prompt every Thursday (based on Diana Wynne Jone’s Tough Guide to Fantasyland) for those who like to compile lists of things. I thought I’d give it a try this week, since the topic is “Fairytales are not just stories” and I love fairytales. I’m still a bit woozy from all the meds I’m taking for my cough so this list is what I was able to scrounge up a few hours ago. But, it was fun remembering how great these little stories were, and since I’m spending more time in bed, recuperating from this dratted cough, I’ll have more time to re-read these again! If you’re a fairytale connoisseur you’ve most definitely read this gem. Ella Enchanted is about a sharp-witted girl “gifted” to obey any commands a person could give her, no matter how mundane. Here begins an adventure of the wills, with Ella willing to make the ultimate sacrifice to protect the one she loves. It’s simply a sweet, funny, charming little story that made me cry and laugh and revel in the magical world. Ella’s story is my favorite re-telling of Cinderella – nothing’s really beat this one since then! “Was finishing school so wearisome that you had to run away?” he asked. “Are you proud of them?” He was alarmed. He shrugged, disliking the topic. I went on anyway. “To begin with, I could teach these boorish ogres how to eat properly.” I seated myself on a large rock. “Observe.” I plucked an imaginary napkin out of the air, shook it twice, and placed it on my lap. “Very ladylike,” Char said politely. “The prince contradicts a lady!” I picked up an imaginary fork and began to saw at imaginary food. “When I don’t see one.” He was laughing. Juliet Marillier does wonderful things to fairytales. Daughter of the Forest is another good one, a fey-filled tale of passion and cruelty based off of the Goose Girl Fairytale. In Wildwood Dancing, our heroine, Jena, and her sisters regularly sneak off at night to enter the world of the fey folk. Jena, in particular, has a little pet frog, Gogu, who she suspects must be a magical being for he can communicate with her through her thoughts. I love what Juliet Marillier did with the Frog Prince and 12 Dancing Princesses fairytales. Jena has to go through difficult trials in order to save her sister and also in order to prove herself to the one she loves. Full of ancient magic, sisterly love, and a great many surprises, Wildwood Dancing is a must read if you’re into collecting fairytale retellings. “first pick of what?” I asked them. “Queen of the Fairies,” I sniffed. The three of us froze in shock. We’d no idea anyone else was there. But as the voice spoke, we saw an old woman, clad all in black, stooped over in the woods nearby. She was gathering yellow mushrooms into a little basket. Maybe she’d been there all the time; she blended into the dark hues of the undergrowth as if she were just another thing that grew there. “What do you mean?” asked Costi. “It’s only a game,” said Cezar. “What rules?” asked Costi, frowning. This one surprised me with how well done it was and has, to this day, been the only fairytale re-telling of East of the Sun, West of the Moon that I actually enjoyed! Cassie lives with her father at a research centre in the Arctic where they study polar bears. But, not everything is explainable by solid scientific fact. One day, Cassie meets a talking polar bear who promises that he can help her find her mother if she will agree to live with him. Turns out the Polar Bear King is a magical being that guides the souls of dying polar bears into the lives of new born ones. It was great fun reading how Cassie uses her scientific training to help the Polar Bear King make predictions about tracking down dying or new born bears. This retelling of East of the Sun, West of the Moon, is also the only retelling of this fairytale in which I found the romance between the polar bear being and our heroine actually believable. In the case of this fairytale, it’s truly no easy feat!! “I did not think you were the kind to give up without trying,” the Bear King said. “I don’t give up,” Cassie said automatically. She thought about it for an instant and then repeated, “I don’t give up.” He’d seen her stubbornness firsthand. She had tracked him until she was nearly out of fuel, despite knowing she was disobeying station rules. That chase felt like it had happened a lifetime ago. She winced—two insults in one breath. She was not leaving because she was weak or cowardly. Was she? He considered it. “Yes,” he said. “I think you are frightened,” he said. “Like hell I am,” she said. Shannon Hale did her version of the Goose Girl fairytale as well in The Goose Girl. 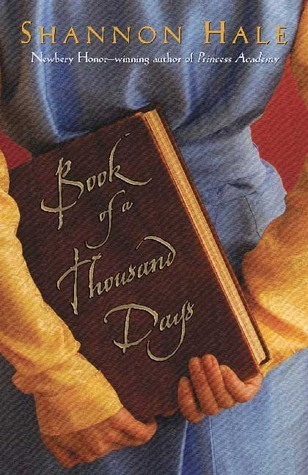 But, my personal favorite of Hale’s work is Book of a Thousand Days which was apparently loosely based off of the Maid Maleen fairytale. In this one, Dashti is a servant to a princess who has been locked up in a tower by her father, apparently for refusing to marry the man her father chose for her. Dashti is clever, resourceful, loyal, full of optimism, and full of surprises. In Book of a Thousand Days, we read the story through her diary, and follow her and the Princess as they wile away their days in the tower and then later on, run/hide from a wicked Khan who is bent on possessing the Princess. While reading this one, you can’t help but route for Dashti’s great spirit! That’s not me, so I didn’t answer. I stayed on my mattress, mending a stocking, wishing on each stitch that my lady would go speak to her khan herself. At last she arose from our one chair and stood before me. I kept stitching, praying she would act. “Speak with him, Dashti,” she said. “Please, my lady…” I shouldn’t have argued, Mistress would’ve scolded, but better to be scolded than hanged on the city’s south wall. In the city, I learned that’s where they execute those whose crimes are so rotten they’d have no hope of ascending into the Ancestor’s Realm. The south wall. The wall farthest from the Sacred Mountain. My lady offered me her hand. How perfect her hands are! I’ve never seen skin like hers, so soft, no rough spots on her fingertips, her palms like the underside of calf leather. She’ll be made to touch nothing harder than water, so I swore by the eight Ancestors and the Eternal Blue Sky. And if what she commands leads my head into a neck rope, then so be my lady’s will. I spoke a prayer in my heart—Pardon me, Nibus, god of order. She sat on my mattress while I lodged the wooden spoon beneath the flap. “I’m here,” I said. I could see his boot in the puddle of moonlight. It was brown leather, double stitched. It would take a mucker a week to make one of those boots. “I didn’t wake you?” he asked. “Oh, no, I never sleep…” I was going to say that I never sleep until my lady does, but I stopped myself. “No, yes, I do, I just, I mean…” I don’t know how to lie to gentry. His voice went dry. I knew he was teasing me, so I said, “And I’ll pray for you to Carthen, goddes of strength. Your ankles look too skinny to carry you.” They didn’t, of course, but accusing one of having skinny ankles is a friendly insult among muckers, and it felt so natural to say. So I did. I was wearing a pair of my lady’s older slippers, the kind with the toe curled up prettily, so I was proud to let him see my foot when I lowered my right leg through the flap down to my knee. I could feel her khan press his own leg against mine, measuring our ankles together. “Not a chance. And it’s not a fair comparison, as you’re wearing boots.” I was giggling. I couldn’t help it, it was so ridiculous, my leg down the dump hole to prove I had sturdy ankles, her khan measuring them, and my lady surely wondering if we’re insane. And then when I tried to lift my leg back up, I got stuck, and I felt his hands unhook the tip of my slipper from a metal catch and help raise my leg. He was chuckling my now, too. 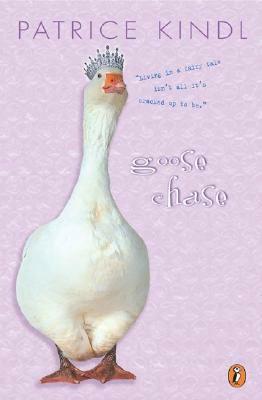 I love this version of the Goose Girl fairytale. In this one, Alexandria is a dry, sharp-witted, poor, average-looking goose girl until one day, she offers a beggar some food. But, instead of actually giving Alexandria something helpful in return, the beggar gifts her beauty and wealth! Oh, the horror! From page one, I was laughing—there are so many clever twists to our favorite fairytale tropes in here. Here, we see how much exactly beauty and wealth can be cumbersome to Alexandria, who just wanted to be left alone to live her life. My name, I must tell you, is Alexandria Aurora Fortunato, and the reason for all this royal rivalry for my hand—besides, of course, my inexhaustible wealth—is that I am lovely as the dawn. You need not laugh; ’tis perfectly true. Back when I was a simple Goose Girl and this calamity first befell me, I used to go down to the duck pond at sunrise to see if ’twas really so. ‘Tis not terribly easy to see yourself in a duck pond—your hair hangs down and gets in the way, for one thing—but if anything, I would have to say that I am a great deal lovelier than the dawn. After all, there are dismal dawns and rain-drenched dawns and dawns as cold as charity, but I am always the same: perfectly, flawlessly lovely. Why, for sheer loveliness I’ll warrant I could beat the dawn nine times out of ten. And that is without even trying. I have not always been as lovely as the dawn. Six months ago I was no more lovely than—what shall I say?—a pickled onion. Well, not so very bad, perchance, but all knees and elbows and I didn’t always keep my face and hair clean. Well, why should I? It never seemed important. The Geese didn’t care how often I scrubbed myself, and that pond water is cold. I was only a poor orphan Goose Girl, you see, with no more use for a perfect profile than I had for a slops basin encrusted with emeralds. I still have no use for either; it seems to me that the combination of great beauty and great wealth is a monstrous cruel handicap for a girl who simply wants to tend to her own affairs and her own Geese. In the future I shall know precisely what to do if another old beggar woman comes pestering me for a bite to eat while I’m herding my Geese in the high meadow. Will I give her my last crust of bread, like the softhearted, simpleminded dunderpate that I am? No I will not; I’ll send her away with a flea in her ear, that’s what I’ll do. ‘Tis said that no good deed ever goes unpunished, and so I am learning to my sorrow. Previous Book Review: Royal Airs by Sharon Shinn. The slums of Chialto may be overcrowded and labyrinthine but somehow the two people most important to the fate of the nation can still find each other without further ado. Who’d have thought? Next Book Review: Dreamer’s Pool by Juliet Marillier. How will a prickly healer hell-bent on vengeance and a hulking brute haunted by nightmares save a Prince and his darling from the sinister workings of an ancient magic? Mogsy – Yes! Juliet Marillier’s stories always linger in my imagination 🙂 She writes stories about the fey folk with just the right amount of ancient otherworldliness. Especially when it comes to forests! Whoop whoop! Ella Enchanted remains one of my all-time favorite fairy-tale retellings. It’s a wonderful take on the Cinderella story, and it’s also so funny and charming. Love the passage you quoted! Jenny – Yes, whoop whoop indeed! Ella Enchanted is a bundle of guaranteed fairytale comfort for sure 🙂 And you gotta love the Ella and Prince Char twosome. So sweet. Mervih – Haha, these are actually pretty short ones. If there was one on this list I’d highly recommend it would definitely be Ella Enchanted. 🙂 It’s a middle grade book but my goodness is it awesome for all ages.